T-Mobile is the most rebellious of the four big carriers in the United States, with its “Un-carrier” moves being the ones that truly shake up the industry. Over the past few years, T-Mobile has killed two-year contracts, ended data overages, and opened up a lot of cool features to its customers. Its service is still a bit spotty in many parts of rural America, but its urban coverage can’t be beaten. If you live in an area that gets T-Mobile service, you’ll definitely want to check out the Un-carrier’s plans. That said, we’ve broken down each of T-Mobile’s plans to help you better understand the good and the bad hidden within. Here are a few main points to get you started. T-Mobile really has only one plan (with another one coming soon), whether you’re looking for a single-line or a family option. The only differences apply to it’s Plus and Plus International add-ons. Its standard plan only offers standard definition when it comes to video streaming, though, lately, it has been running promotions to include HD streaming at no additional cost. The T-Mobile One Plus International plan is the best plan out there for overseas travelers, by far. Plans are “all-in,” meaning taxes and fees are baked into the cost of the plan. T-Mobile Tuesdays is a nice — albeit, slightly gimmicky — perk, given you get free or discounted stuff on a weekly basis, like $15 Lyft credits. Editor’s note: This is non-promotional pricing — your mileage may vary. For instance, as of this writing, a two-line plan was $100 per month. The unlimited plan is best for families of four or more. It’s also great for individuals who are data hogs. If you don’t have internet at home and rely on your phone plan for internet access, the unlimited plan is also a great choice. However, it is expensive for individuals and small families. T-Mobile does offer a lot of perks to make this plan worth your while, though. Families can also add on additional devices such as tablets or wearables for $20 per line per month and $10 per line per month, respectively. For the tablet, you’ll have unlimited high-speed data, texting, and 3G tethering. As for wearables, the plan offers unlimited talk, text, and data up to 512Kbps. Under the T-Mobile One plan, the carrier announced its “Free Add-A-Line” deal. For a limited time, customers who add an additional line to their existing voice line can get another one for free via monthly bill credits. The new promotion follows a new study released by industry analyst firm Strategy Analytics, which shows that T-Mobile One customers get up to $1,550 in extra value-add per year (on top of unlimited text, talk, and data). For a family of four, the value goes up to over $5,150 per year. This is all thanks to the included benefits like free subscriptions to Netflix, Gogo’s Inflight Wi-Fi service, T-Mobile Tuesdays, and more. The T-Mobile One plan is best for families of three or more people because you get unlimited data for a good price. Most people really don’t need to pay for the high-resolution video or tethering add-ons on a data connection, so don’t do it. T-Mobile One is also great for people who travel because you get unlimited text and 3G data in more than 100 countries. Unlimited texting and 3G/2G data in more than 100 countries worldwide. Calls are 20 cents a minute. Unlimited talk, text, and data in Mexico and Canada. Unlimited text and an hour of Gogo internet access on select flights. The T-Mobile Tuesdays app, which gives you free things and discounts on stuff every Tuesday. Videos stream at a lower, 480p resolution when on a data connection. If you want HD video, you’ll have to pay an extra $10 a month per line for the One Plus plan, but watch for occasional promotions. If you surpass 26GB of 4G LTE data, your speeds will be throttled to 2G. You must sign up for Auto Pay on your bills, or T-Mobile will charge an extra $5 per line each month. The One Plus plan includes unlimited tethering with the first 10GB of data used at full 4G LTE speeds, unlimited high-speed data in more than 140 countries, unlimited HD streaming, and unlimited Gogo in-flight Wi-Fi. It adds $10 per line to the cost of your plan, however. Here’s what it’d look like if you added it to every line. Like we said, the T-Mobile One Plus International plan is the best international plan we’ve seen for overseas travelers. You gain unlimited calling to landline numbers in over 70 countries, and mobile lines in more than 30, and there are no limits on 4G LTE tethering. There’s one downside, though: It’s $25 per month. Our recommendation is that you add this only to the lines that absolutely need it. Otherwise, your five-line plan will balloon to more than $300 per month. Mobile without Borders: T-Mobile users get unlimited talk, text, and data in Canada and Mexico, as well as the United States. 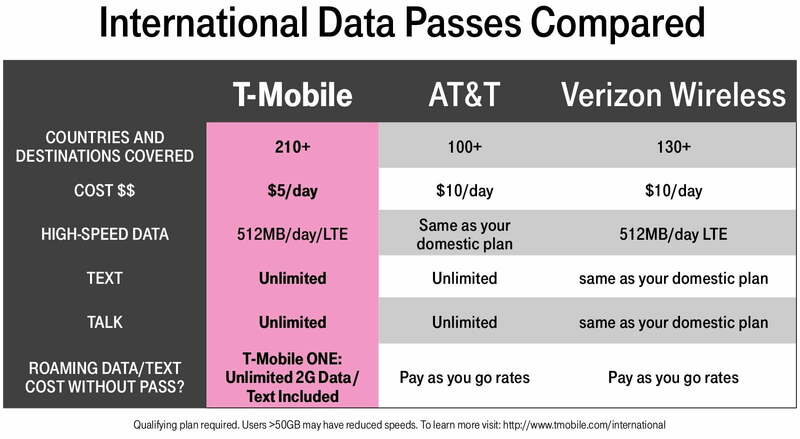 Unlimited text and data at lower speeds is also available in nearly 150 countries worldwide, though, calls cost 20 cents per minute unless you’re on the T-Mobile One Plus International plan. Spotty coverage in rural areas, however, there has been significant improvement in the last year. Once you surpass 26GB of data, you may be throttled. T-Mobile announced a new, cheaper plan that will be available starting August 10. For a single line T-Mobile Essentials will cost you $60 for the first line, $30 for the second line, and $15 for each line after that — all of which include AutoPay. If you don’t enroll in AutoPay, it will cost you $5 more per line. You get unlimited talk, text, and data in the U.S. along with unlimited 3G mobile hotspot data. While it’s $10 less than the carrier’s T-Mobile ONE plan, there are a few downsides. For starters, video only streams up to 480p and internet speeds (as well as video quality) are throttled if you go over 50GB of data per month. Unlimited texting and 4G LTE data in more than 100 countries worldwide. Unlimited talk, text, and 2G data in Mexico and Canada. Unlimited 3G mobile hotspot data. Videos stream at a lower, 480p resolution when on a data connection. If you surpass 50GB of 4G LTE data, your speeds will be throttled. In July, T-Mobile’s International plan expanded to 70 more countries — bringing it to a total of 210 countries. With Simple Global, you will have 2G data for unlimited talk and text along with flat-rate calling at 25 cents per minute. While the plan does offer unlimited data, it’s important to note that 2G is incredibly slow and might not work well everywhere — even if it’s under the list of T-Mobile’s qualifying countries. But if you’re looking for high-speed data while traveling around the globe, the carrier has another option. Starting August 1, customers can purchase a new T-Mobile daily data pass for $5 per day. With the pass, you’ll get 512MB of LTE speeds, as well as unlimited talk and text. When compared to competitors like AT&T and Verizon, T-Mobile does cover the greatest number of countries for half the price.